When I watched a video of Bosnian Croat military commander, Slobodan Praljak (left) drank a bottle of poison and committed a public suicide inside of the courtroom on November 29 2017, the first thing that came in my mind was another public suicide committed in 1987 by the Pennsylvania State Treasurer, Budd Dwyer (right). Their facial expressions are almost identical. 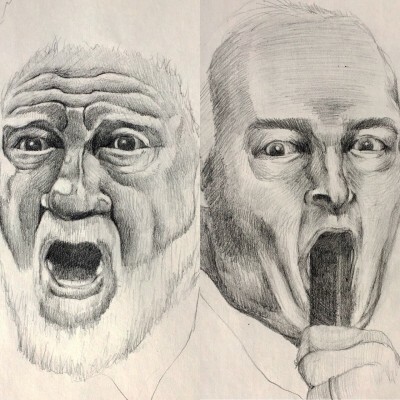 These are the drawings of their facial expressions, almost a half a second before they made their action. We really don’t see this type of intensity in people’s face regularly. I saw some very subtle emotions in their faces: the eyebrows are warped from fear and anxiety (less movement on Dwyer’s face). It looks like their skin and facial muscles are irritated and carrying a lot of tension. However, most importantly, it is their eyes. They are slightly out of focus, and contain a mix of all the negative emotions including fear, worry, sadness, anger, regression, guilt, and nervousness. I see anger especially, because their eyeballs are coming out forward with heavy pressure, like they are about pop out of the eye sockets. I could almost hear their heart beating like crazy, and felt their sweat right at the moment, just by looking at their faces. I cannot imagine someone who is on the edge of a cliff in life, being cornered, mentally plunged, and just dropping it. Praljak had some poison to resist the consequences of his guilty verdict. Dwyer put a .357 Magnum revolver in his mouth, and pulled the trigger to escape from his disgrace. Whatever the reason is, a strong determination to end one’s life must be paired with a firm emotion, like “anger”.